Phases of Nix, 2018-19, computer animation, 26'40'', color, silent. Courtesy of artist. Artist and researcher Kerem Ozan Bayraktar has been working and thinking on systems. Planets, as part of the planetary system, are also among his research interests. His exhibition Chance and Necessity opened last year at Sanatorium, where he showed the series of 13 planets titled Potentially Uninhabitable Planets, and other works with Sergen Şehitoğlu.The series focused on the planets, which have been presented as “the new Planet Earth” due to some speculative findings of water and atmosphere, but did not actually have any real potential for life. The exhibition was built on the idea of emergence, which simply signifies some patterns that emerge in complex/chaotic systems through interactions. Just like how the news about these planets focused on the potential outcomes of random interactions. Kerem is also interested in natural systems; he is conducting an extensive research on urban plants while questioning how natural and artificial systems can co-exist. 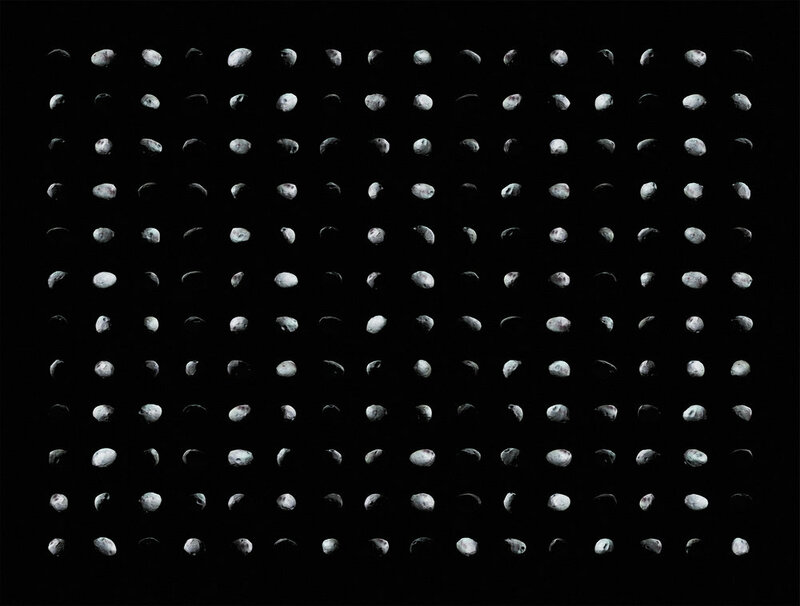 Phases of Nix, a video in which movements of Pluto’s satellite Nix were visualized, is currently on view at Bilsart. Taking the exhibition as a starting point, we talked about the phases of Nix as well as Kerem’s phases of thinking while he worked on this video. First of all, could you introduce us Nix? It’s not a popular name among planets and satellites. Nix is one of the five satellites of Pluto. Its rotation around its own axis has chaotic properties because it is situated in a dynamic center of attraction. The direction it follows and how long the days last change in very short durations. Thus, its behavior cannot be predicted. I was interested in asteroids as residues of collisions, as remainders, as objects that are tossed aside or pushed away from the system. During that time Nix interested me as an object which is quite in-between and which can rotate around a planet without falling into pieces or crashing, even though it is very chaotic. Even though they are not accurate, scientific ways of visualization play an important role to make us believe in what we see. What motivates you to visualize some scientific facts through art, to use a medium which we don’t think of as factual but rather fictional? For example, there are two known photographs of Nix and you produced the video after those two images. Did you care if it was a realistic depiction? The ideological side of scientific visualizations, their place in the visual history and how they build reality are all very interesting to me. The scientific images are not meant to be art but technically they are similar to art that we are familiar with. Forensic paintings or botanical paintings are two good examples to this phenomenon. What we see are not the events/facts themselves but their paintings, and these paintings are always somehow connected to art. One should not forget that cameras were once perceived as factual, scientific machines. Science and art can use common methods of image production. Technically, I frequently repeat different areas’ methods of producing reality through images. Sometimes I imitate them. I’m also keen on the idea of building a different history through fictional images which might seem like documentary images. On the other hand, I would like to emphasize that Phases of Nixis not scientific data visualization or a simulation, either in terms of its movement or in terms of how it looks. I used data in limited terms. My goal was not to indicate a specific time zone in the video as well as in the calendar-like image. Thus, the video and the image exist in their own ways, free of all other issues. In short, they are not instrumental images that were produced to express a scientific matter. However, I cannot say that the work is totally science-fiction because it develops out of incidents. It could be taken as a sort of impressionism, but an impressionism where there are many interfaces in between. The phases of Nix depiction on the poster is like the visualization of our trust in science. 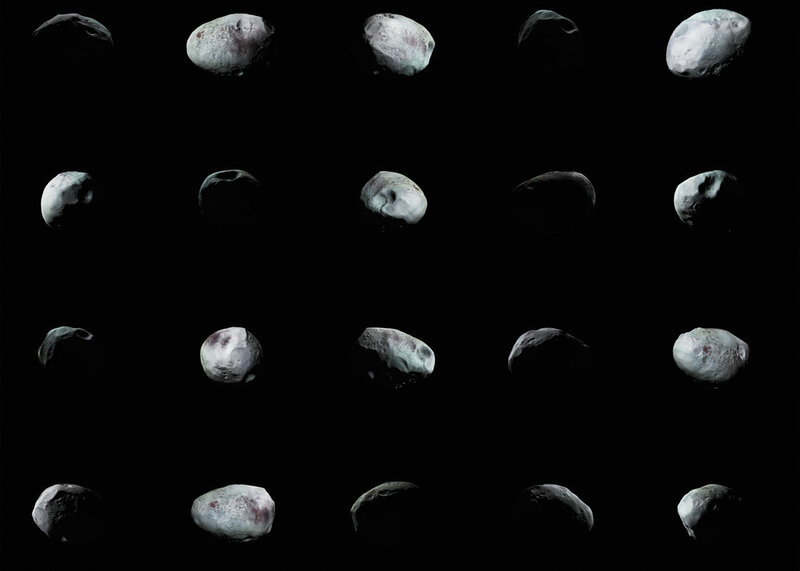 The phases of Nix are reminiscent of phases of the Moon. We are using calendars that are built on the movements of the Moon and the Sun, but how regular are these movements in reality? Do you think it is problematic to look for an order in natural systems? All the calendars we use are reflecting on our efforts to synchronize with nature, but this is not technically possible because calendars are man-made devices, made to simplify our daily life. They do not organically represent nature. That’s why there is constant drifting, which is so small that it doesn’t affect our lives. All order that we observe is transient. There is no harmonic or repetitive order in nature. On the other hand, all living beings must practice inductive reasoning in order to stay alive. If I start doubting that a piece of bread I’ve been eating everyday might poison me tomorrow, living becomes impossible. We can stay alive thanks to our belief in repetition. That’s why there is an obligatory bond between order and life. It is just important to remember that order is not intrinsic to nature, it appears in our interaction with nature. In his book The Order of Time,Carlo Rovelli relates our perception of time to our need for categorizing, systemizing and simplifying in order to understand systems in a better way. For example, according to him the idea of “now” is not very realistic because it is never possible to talk about a now. Or, time passes faster in the mountains than it does at sea level. How do you perceive time as a system? How do you imagine the passing of time in the Phases of Nix? In Rovelli’s book what interested me the most was his ideas about the direction of time. Why can we only know the past but not the future? Because of the thermodynamic laws, heat only flows from hot to cold. We can only understand the passing of time at places where we can observe this. For example, we know in what direction the time moves when we see a sugar cube dissolving in tea. In the Phases of Nix, there is no direction of time. If I play the video in reverse, the audience would not be able to tell because there is no reference that the object interacts with. I’ve always thought that painting is about simple present tense. Maybe it is also the case about this work. We live in a structure where natural and artificial systems co-exist. In time, you stopped looping your videos or your interest switched from terrariums to urban plants. We may believe that the planets are quite predictable and even able to predict the future, but urban plants are a very unpredictable natural system. Could you elaborate a bit more on your research on plants? I’m especially interested in ruderal plants. Their relationship to the city is chaotic: it’s a relationship that builds on emergence and it is incalculable. Thus, these plants usually act in contradiction to our traditional city planning methods. They always grow in unwanted territories and they invade areas by springing to unconventional places. Plants react directly to light, nutritional resources, atmosphere and even to economics and social matters just like we do. That’s why it is also possible to read them as a dynamic indicator, just like Nix is an indicator of gravitational forces. Nix'in Evreleri, 2018-19, bilgisayar animasyonu, 26'40'', renkli, sessiz. Sanatçının izniyle. Sanatçı ve araştırmacı Kerem Ozan Bayraktar, bir süredir sistemler üzerine düşünüyor ve çalışıyor, gezegenler de bir sistem olarak ilgi alanında. Geçen yıl Sanatorium’da Sergen Şehitoğlu ile beraber Rastlantı ve Zorunluluk başlıklı bir sergisi olmuş, bu sergide de 13 gezegenden oluşan bir seri olan Potansiyel Olarak Yaşanamaz Bazı Gezegenler Serisi’ni göstermişti. Bu seri aslında yaşanması mümkün olmayan fakat medyada “yeni bir Dünya” olarak sunulan, su ve atmosfer bulunduğuna dair spekülasyonlarla haber olan gezegenlerden oluşuyordu. Sergi aslında temelde belirme kavramı (emergence) üzerine kurgulanmıştı. Bu kavram da, basit olarak karmaşık sistemlerde birtakım etkileşimler sonucu ortaya çıkan paternlere işaret ediyor. Bu gezegenlerdeki yaşam olasılığı haberleri, aslında rastlantısal olarak mümkün olabilecek bazı etkileşimlerin potansiyel sonuçlarına odaklanıyordu. Kerem aynı zamanda doğal sistemlerle de ilgileniyor, buna dair sokak otları üzerine yürüttüğü kapsamlı bir araştırma var; yapay ve doğal sistemlerin bir arada nasıl var olabileceğine dair düşünüyor. Plüton’un uydusu Nix’in hareketlerini görselleştirdiği video çalışması Nix’in Evreleri, Bilsart’ta sergileniyor. Kerem ile sergiden yola çıkarak hem Nix’in evrelerini, hem de Kerem’in bu işi üretim sürecindeki düşünce evrelerini konuştuk. Öncelikle Nix’i tanıtabilir misin? Gezegenler ve uydular arasında pek popüler bir isim değil. Nix Plüton’un beş uydusundan bir tanesi. Oldukça dinamik bir çekim merkezinde yer alması nedeniyle kendi etrafındaki dönüşü kaotik özellikler gösteriyor. Ne yöne döndüğü ve günlerin ne kadar sürdüğü çok kısa aralıklarla değişiyor. Bu yüzden nasıl davranacağı öngörülemiyor. Ben bir dönem çarpışmaların artığı olarak, bir tür kalıntı, kenara atılmış, sistemin dışına itilmiş nesneler olarak, asteroidlerle ilgileniyordum. O süreçte, çok arada kalmış, bu kadar kaotik olmasına rağmen gezegen etrafında parçalanmandan ya da bir yere çakılmadan, bir şekilde hala dönebilen bir nesne olarak Nix çok ilgimi çekti. Bilimsel görselleştirme biçimleri aslında tam olarak gerçek olmayan görselliklere inanmamızda önemli rol oynuyor. Senin bilim alanına giren gerçeklikleri, gerçekliğine inanmadığımız sanat yoluyla kurgusal olarak görselleştirmenin altında nasıl bir içgüdü var? Örneğin Nix’in bilinen iki fotoğrafı var ve videoyu bunlar üzerinden kurguluyorsun. Gerçekçi bir tasvir olması senin için önemli miydi? Bilimsel görselleştirmelerin ideolojik tarafı, imgeler tarihi içindeki yerleri ve gerçekliği nasıl inşa ettikleri ilgi çekici bir alan benim için. Bilimin imgeleri temelde sanat olarak yapılmıyor ama teknik olarak alışık olduğumuz sanatlara benziyor. Örneğin mahkeme ressamlığı ya da botanik ressamlığı da bu şekilde. Gördüklerimizin olayların kendisi değil de onların resimleri olması ve bu resimlerin sanatla hep bir bağının bulunması söz konusu. Fotoğraf makinasının bir zamanlar nesnel, bilimsel bir aygıt gibi anıldığını unutmamak gerek. Bilimle sanat, ortak imge üretim yöntemlerini kullanabiliyor. Ben farklı alanların imgeler yoluyla gerçeklik üretimlerini teknik açıdan sık sık yineliyorum, zaman zaman taklit ediyorum. Gerçekte olmayan ama belgesel gibi davranan görüntülerle başka bir tarih inşa etme fikrini de seviyorum. Diğer yandan Nix’in Evreleri’nin ne görsel ne de hareket açısından bilimsel anlamda bir veri görselleştirmesi ya da simülasyon olmadığının altını çizmek isterim. Verilerden sınırlı şekilde yararlandım. Benim amacım videoda ve takvimimsi görselde spesifik bir zaman dilimine işaret etmemekti. Bu yüzden tüm meselelerden bağımsız olarak bu videonun ve görselin, bambaşka konularla da ilişkilenen kendine özgü bir varoluşu var. Bilimsel bir meseleyi anlayalım diye yapılmış araçsal özellikte şeyler değiller yani kısacası. Buna karşın çalışmanın tümüyle bilim kurgu olduğunu da söyleyemeyiz çünkü olaylardan kalkınıyor. Bir tür empresyonizm belki. Ama arada çok fazla arayüzün olduğu bir empresyonizm. Bilime sorgusuz duyduğumuz güvenin görsel hali gibi hissettiren bu posterde gördüğümüz evreler, Ay’ın evrelerini hatırlatıyor. Üzerine takvimler kurguladığımız Ay ve Güneş’in düzenli hareketleri, gerçekte ne kadar düzenli? Sence doğal sistemlerde düzen aramak bir problem mi? Kullandığımız bütün takvimler doğayla senkronize olmaya çalışıyor ama bu teknik olarak mümkün değil çünkü takvimler gündelik hayatımızı kolaylaştırmak için bizim inşa ettiğimiz şeyler, doğanın organik bir işareti değiller. Bu yüzden sürekli kaymalar oluyor ama bu kaymalar görece küçük olduğu için hayatımızı çok etkilemiyor. Gözlemlediğimiz düzenlerin hepsi geçici. Doğada harmonik, sürekli tekrar eden bir düzen yok. Diğer yandan yaşamak için tüm canlılar tümevarım yapmak zorunda. Bugüne kadar her gün yediğim ekmeğin yarın beni zehirleyeceğinden şüphelenirsem yaşam imkânsız hale gelir. Biz tekrara olan inancımız sayesinde hayatta kalabiliyoruz. Bu yüzden düzenle yaşam arasında zorunlu bir bağ var. Sadece, düzenin, doğaya içkin olmadığını, doğa ile bizim etkileşimimizde ortaya çıktığını unutmamak gerekiyor bana kalırsa. Carlo Rovelli “Zamanın Düzeni” kitabında zamanı algılayış biçimimizle ilgili pek çok şeyi, insanların her şeyi kategorize ederek, sistemleştirerek ve basite indirgeyerek anlama çabasıyla ilişkilendiriyor. Örneğin “şimdi” kavramını gerçekçi bulmuyor, şimdi’den asla bahsedilemeyeceğini söylüyor. Veya dağlarda zamanın deniz kenarına göre daha hızlı aktığını yazıyor. Sen zamanı bir sistem olarak nasıl düşünüyorsun? Nix’in evrelerinde zamanın geçişine dair nasıl bir algı var? Rovelli’nin kitabında zamanın geçişine dair benim en çok hoşuma giden nokta zamanın yönüyle ilgiliydi. Neden geleceği değil de sadece geçmişi bilebiliyoruz? Çünkü ısı akışı termodinamik yasaları gereği sıcaktan soğuğa doğru gerçekleşiyor. Sadece bunu gözlemlediğimiz yerlerde zamanın akışını algılayabiliyoruz. Örneğin çaya atılan bir şekerin eridiğini gördüğümüzde zamanın hangi yöne aktığını biliriz. Benim videomdaki temsilde ise bu anlamda bir zamanın oku yok. Videoyu ters de oynatsam bunu fark edemeyiz çünkü nesneyi etkileşimde görebileceğimiz bir referans yok. Resim sanatının hep geniş zamanı gösterdiğini düşünmüşümdür. Sanırım bu durum bu çalışma için de geçerli. Doğal ve yapay sistemlerin bir arada olduğu bir yapı içerisindeyiz. Senin ilgin de zaman içinde tekrarlı videolar ve teraryumlardan tekrarsız video ve sokak otlarına doğru yöneldi. Geleceğimiz hakkında bile medet umduğumuz gezegenlerin yanı sıra, sokak bitkileri bana göre öngörülemez bir doğal sistem. Biraz bitkilerle olan araştırmalarından da bahsedebilir misin? Sokak bitkilerinin özellikle de benim çalıştığım “ruderal bitkilerin”, şehirle kurduğu etkileşim karmaşık, belirmeye dayalı ve hesaplanabilir değil. Bu yüzden bizim geleneksel şehir planlanması metotlarımızla sık sık ters düşüyorlar, hep istenmeyen yerlerde büyüyüp, tuhaf sıçramalarla mekanları istila ediyorlar. Bitkiler ışığa, besin kaynaklarına, atmosfere ve hatta ekonomiye ve sosyal meselelere bizim gibi direkt tepki veren canlılar. Bu yüzden onları dinamik bir gösterge gibi okumak da mümkün. Tıpkı Nix’in kütleçekimsel ilişkilerin bir göstergesi olması gibi.